All transactions are safe and secure with a reliable history in online purchasing behind each of our associates. 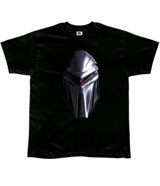 Buy the BSG Cylon Centurion t-shirt to own Battlestar Galactica clothing and merchandise. This Battlestar Galactica tee displays the head of a Cylon Centurion foot soldier. The Centurion carries out a variety of functions within the Cylon hierarchy, acting as guard, soldier, gardener, janitor, and periodically executioner. Centurions are sentient machines, controlled by an implanted device called a telencephalic inhibitor, which prevents them from becoming fully self-aware. The back of this BSG tee displays the Battlestar Galactica TV show logo. In addition to the BSG Cylon Centurion tee above, browse the Battlestar Galactica Clothing Gallery for more apparel like men's and women's clothes, kids shirts or hoodies.